Google has launched a new home page for Korea that departs from Google’s “classic,” minimalist home page approach. The new look features animated product buttons below the search box and will become the default home page in the country, a move Google is comfortable with given the near universal presence of broadband. (The icons are represented above as colored dots below the search box, but appear as you mouse over them on the live page.) 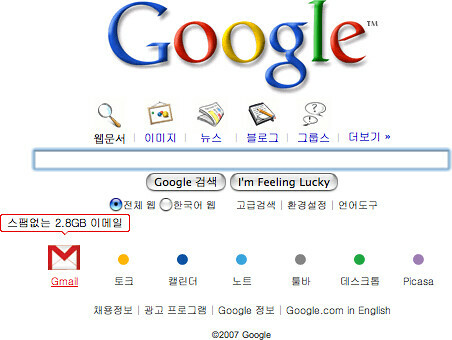 The new home page went live in in conjunction with a 5pm U.S. Pacific time speech in Seoul by Google CEO Eric Schmidt. Google’s classic home page was intended to load quickly, according to Craig Silverstein, Google employee number one and unofficial Google historian (officially, Technology Director at Google). Google’s personalized iGoogle home page also offers a more graphically rich experience, featuring multiple themes that users can choose from. The new, animated Google Korea home page is intended to help Google better compete in the country where it seeks to gain market share. “It was important where our classic minimalism wasn’t working that we adapt,” Marissa Mayer, Vice President, Search Products & User Experience at Google, told Danny Sullivan in a briefing earlier today.